Not so long ago, if someone had invited me to visit their soft opening, I'd have thought I was on some sort of promise. Nowadays, what with taking a keener interest in the restaurant business and everything, I am much clearer on the subject and am happy to report that it represents the sensible modern practice of quietly opening the doors to a new restaurant and offering generous discounts to customers on the understanding that they're playing guinea pigs. It's a chance for the kitchen to learn its lines properly, the front of house team to get to know what questions the customers are likely to ask and the management to spot any obvious issues they hadn't anticipated during the planning phase. From the punters' point of view it's a double-edged sword: there are definite bargains to be had, but you'd better be prepared for some less-than-slick dining experiences too. And so to Scott's, the Mayfair institution whose long-awaited re-opening is softly progressing across town this week. Scott's has been in its current location on Mount Street since 1969 but has a far longer heritage, having originally opened as an oyster warehouse in 1851. Its reputation as a fashionable hotspot eventually and inevitably attracted the attention of Caprice Holdings, who bought it last year and clearly felt it needed sprucing up if there was going to be a chance of recreating its venerable reputation. On the strength of last night, they still have a long way to go. First impressions on arrival were very promising. A warm enough welcome despite the firm refusal to allow Howard to bring in his posh camera. I think they had him pegged as a paparazzo. Fair enough. We were shown to our table near the central oyster kitchen/bar and took in a well designed art deco style room with warm colours, smart tableware and comfy things to sit on. It was pretty busy and there was a welcoming buzz about the place. The four of us settled ourselves in and waited to be waited upon. This was where things started to go a little wrong. According to the restaurant's own publicity, the place had been formally open for two days, so while we might have expected a few teething troubles, we thought they'd have basically got the hang of things. Oh dear. In retrospect it seems harsh to lay it on too thick, but it really was a comedy of errors: Howard had to speak to four different waiting staff before he could get anyone to understand his request for a Manzanilla, hastily (but no more successfully) generalised to a dry sherry; Mark's martini came in a chunky whisky glass and was served not very dryly on the rocks (and this from a place where Ian Fleming apparently discovered the 'shaken not stirred' dry martini); we were given the requested wine list only to be told there were only three reds and three whites on offer at the moment; my wine glass was topped up before I had touched it with a completely different wine (a third of the establishment's entire selection in the same glass); our waitress didn't know where the loos were; and the wait for our hot food was truly epic. If we hadn't ordered a cheeky dozen oysters to amuse our bouches we'd have been fainting with hunger. As with all the food (when it eventually arrived), the oysters were great. Duchy of Cornwall No.3s. Sweet and smooth and perfectly fresh. We couldn't resist the suggested spicy sausage accompaniment for an extra three quid. Good stuff. For starters (nearly two hours after we arrived) we had a good mixture. 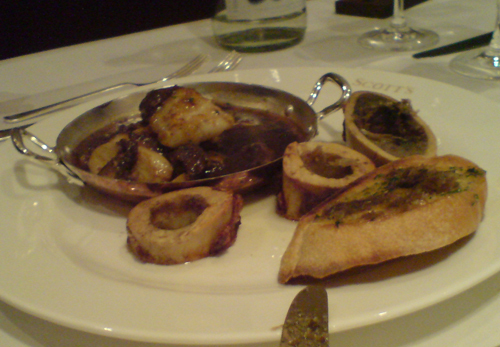 Spider crab for me (creamy meat nicely complemented by breadcrumbs and fresh herbs in a classic seafood stuffing), cods tongues for Howard – "cods tongues taste like cod" – which came with ceps in a Bordelaise sauce accompanied by some unannounced but welcome (if a little overdone) roasted marrow bones. 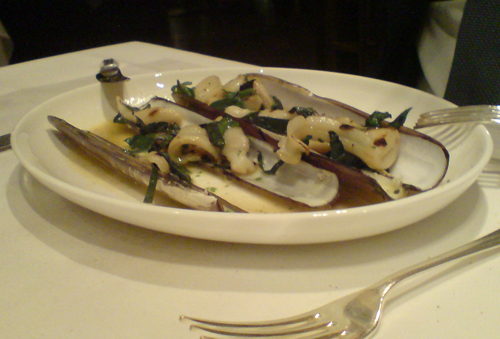 Nick had some good razor clams, while Mark sparked predictable food envy with his baby squid with double fried egg. Extra bread was required to soak up the inky, yolky residue. The mains were just as good. My slip soles in brown shrimp butter proved to be a pair of perfectly cooked fish in a tasty slick sprinkled with tiny tails and capers. 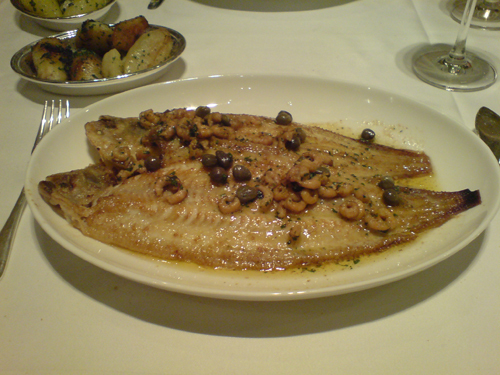 Nick relished his skate with periwinkles, while Mark needed no encouragement in polishing off his special of John Dory with mussels and clams. 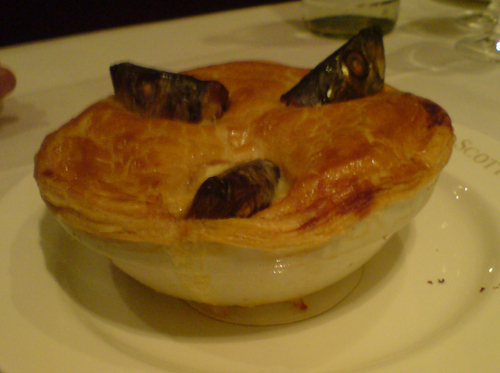 Howard gazed smugly at his stargazy pie; the little fishies stared inscrutably back. This, he reported, was delicious, if a little short on content. This may account for its price, which at £10.50 was cheaper than some of the starters. Great to see it on a menu, though. Pricey accompanying veg, including some mildly addictive roasted Jerusalem artichokes, erred on the side of overdone-ness and were all a bit too buttery. After all this food and all the waiting around we decided to forego pudding and signalled our waitress – beautiful but bemused would sum her up best – with the universal signal for the bill. As if to confirm our worst fears she somehow mistook this for a desire to order dessert and wandered over with her pad. As with some of her colleagues, it seemed she'd not only never worked in a restaurant, she'd never been in one either. Gosh. I shall be asking you to keep zipped after mine ;-) I was debating the ethics of reviewing a place in soft opening, but given that they are now formally open and you paid for the experience then fair cop. Why is service so often overlooked in favour of the food styling? It's a puzzle that amazes me. Perhaps the review didn't make it clear. We didn't pay for the food. We only found out that it was soft opening when we came to get the bill though. Before that we'd thought it was normal service. As for the ethics of reviewing a place during soft opening, as long as you make clear in the review that's what the restaurant was doing, why not? It's about as ethical of getting the customers in during this period - you should be able to write about any experience you have. Also, to be fair, we have said that their food's very good. I was gobsmacked by this piece when I read it the other day and my father and I were having a good laugh - not at you guys of course but at the scene you paint which is worthy of a comedy film. I've had some bad service, but not this bad!